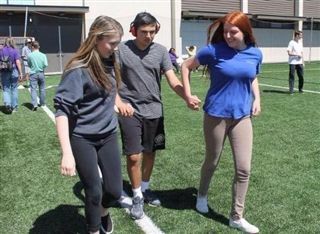 On Wednesday, March 23rd, Upper School Service Learning groups Sports Force and FAST (Friends Assisting Special Needs Teens) hosted a group from The Country School for some friendly kickball on the Pacific Ridge athletic field. The Country School, located in San Marcos, serves students with Autism, Asperger's Syndrome, ADD/ADHD, and other forms of mild to moderate disabilities affecting learning, behavior, and social skills. FAST visits The Country School regularly to build relationships, lead arts activities, and play games. Students from both schools had a great time cheering, running the bases, and making new friends.